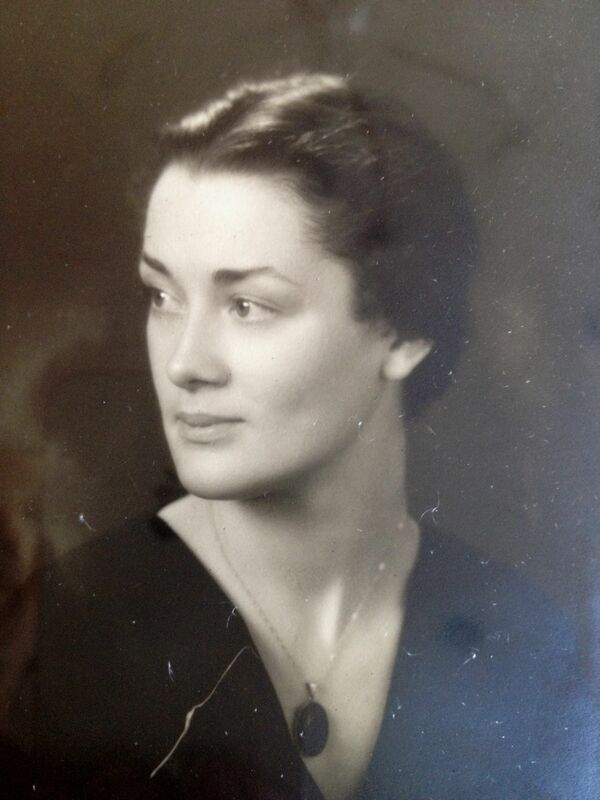 Myrtle, my maternal grandmother, made a killer chicken pot pie. Essentially a chicken stew with a pastry crust, pot pie is at once the ultimate expression of love and the ultimate way to use up leftovers. (Two things near and dear to Myrtle’s heart.) Myrtle’s pie crusts were always perfectly light and flakey, and most of the time she’d make just the tops for everyone’s individual pies; why bother with bottom crusts which would just get soggy from the filling? Indeed! Myrtle also loaded her pot pies with vegetables from her Hood Canal garden, which was about three times the size of her kitchen. She was doing “organic,” “local” and “seasonal” way before it was trendy. 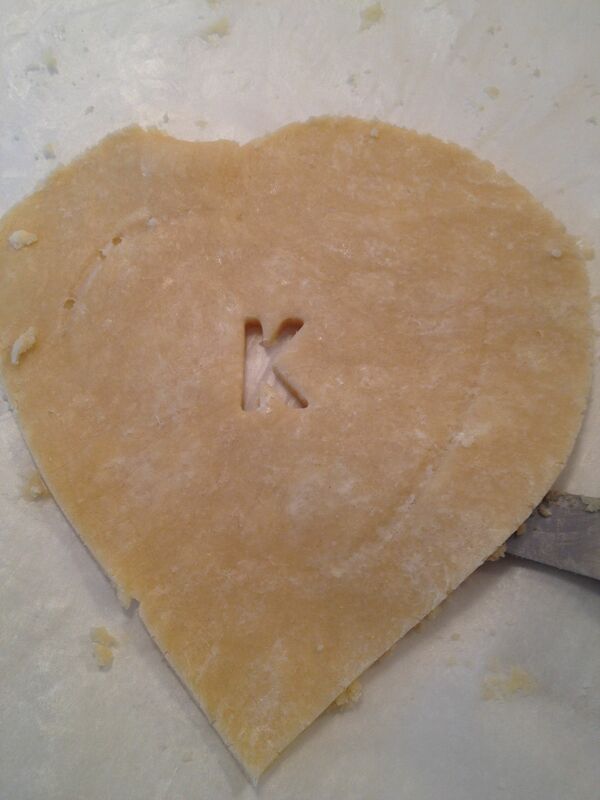 A true romantic, Myrtle would be thrilled to know that my husband credits our engagement to her chicken pot pies. 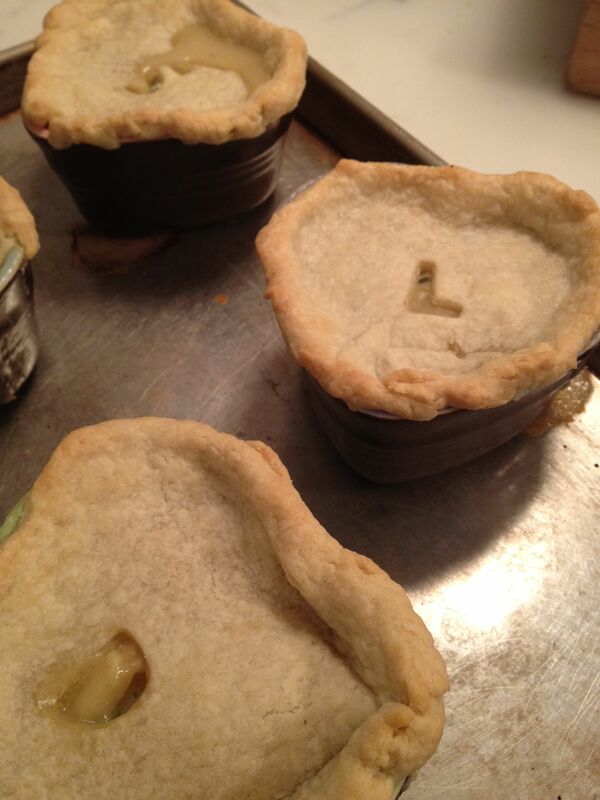 As a thoughtful (and some might say calculated) gesture, I used to make 3 or 4 pot pies at a time for him while we were dating; he’d keep them in his NYC freezer for a midweek respite from General Tso’s take-out. Over the years I’ve made some tweaks to Myrtle’s recipe – adding some additional flavorings to the sauce, swapping out some of the vegetables, making the pastry with butter instead of Crisco, and sometimes baking the pastry tops separately. Feel free to make your own modifications, including the use of ready-made pastry dough or puff pastry if dough-making is a deal-breaker. Homemade pastry crust might sound intimidating, but it’s truly simple! 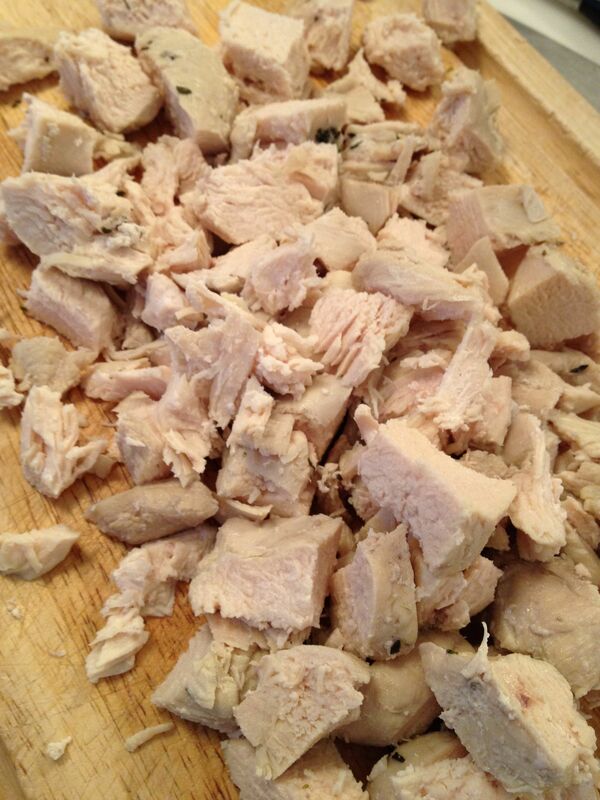 (Especially if you use a food processor.) Depending on your ambition or your mood, you can either cook the pastry tops on top of the filling in ovenproof bowls or ramekins, or bake the tops separately on a parchment-lined baking sheet. 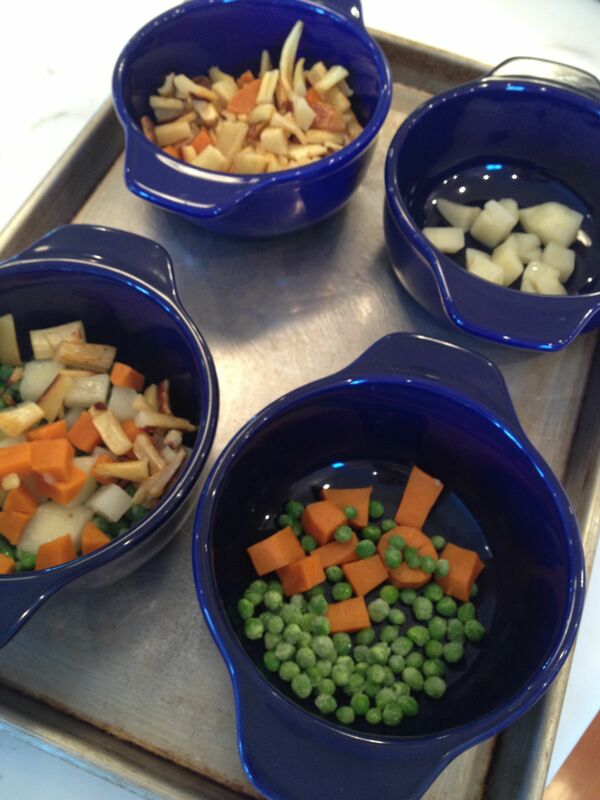 Ovenproof bowls are not required for this method and assembly is somewhat easier; the pastry crusts also get crisper. Examples of both methods are shown below. 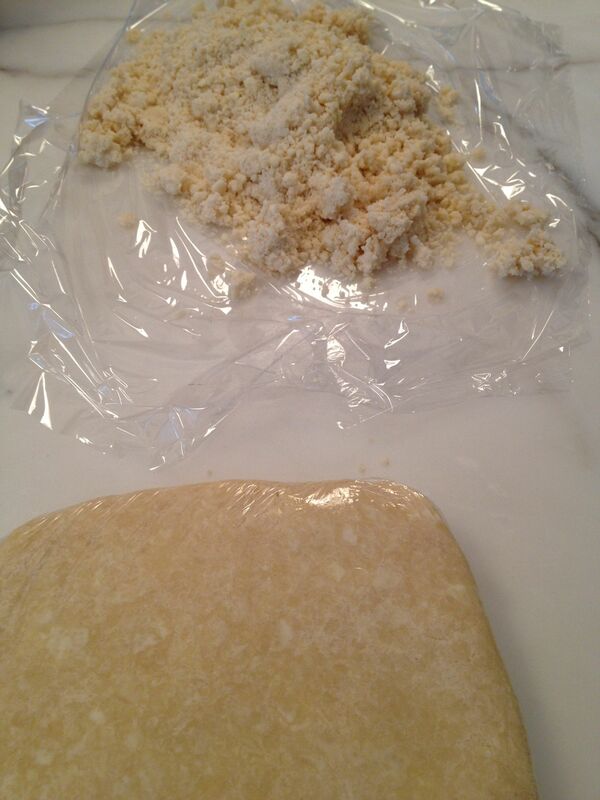 Form dough into 2 discs (I use plastic wrap to help the dough come together and contain the mess.) 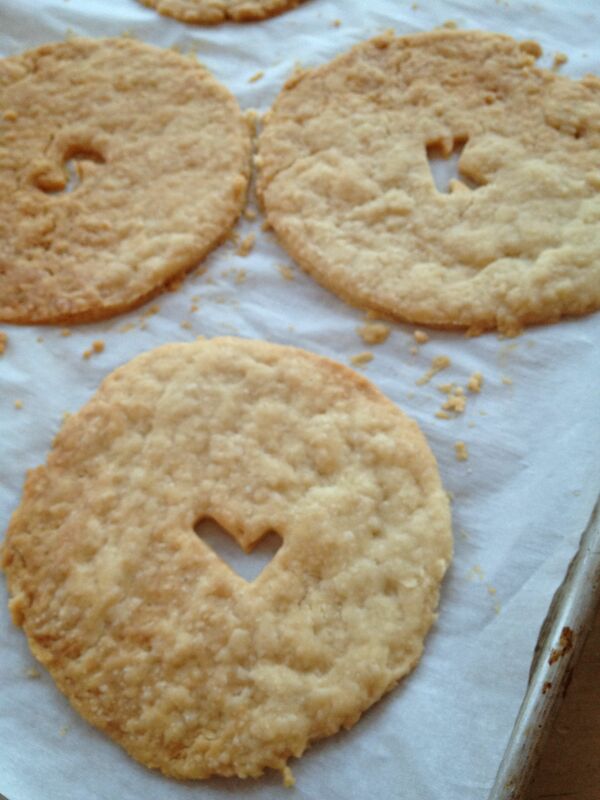 With a sheet of parchment paper below and a piece of plastic wrap on top, roll out a dough disc to about 1/8” thickness. 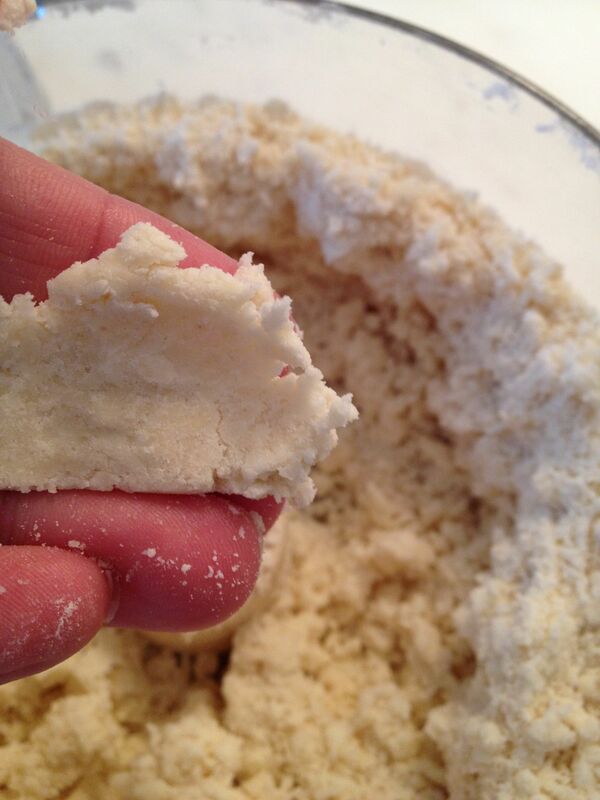 Using intended serving bowls as a guide, trim dough to fit. 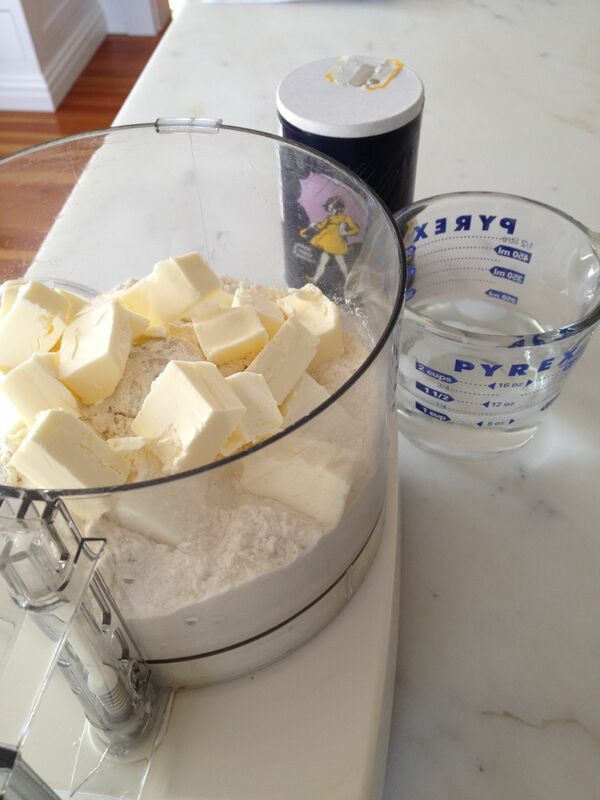 (Flush to edge for pre-baked method or with a ½”+ overhang for the bake-together method.) Gather excess dough and repeat until you have enough tops made. Cut out a small shape or initial if desired. 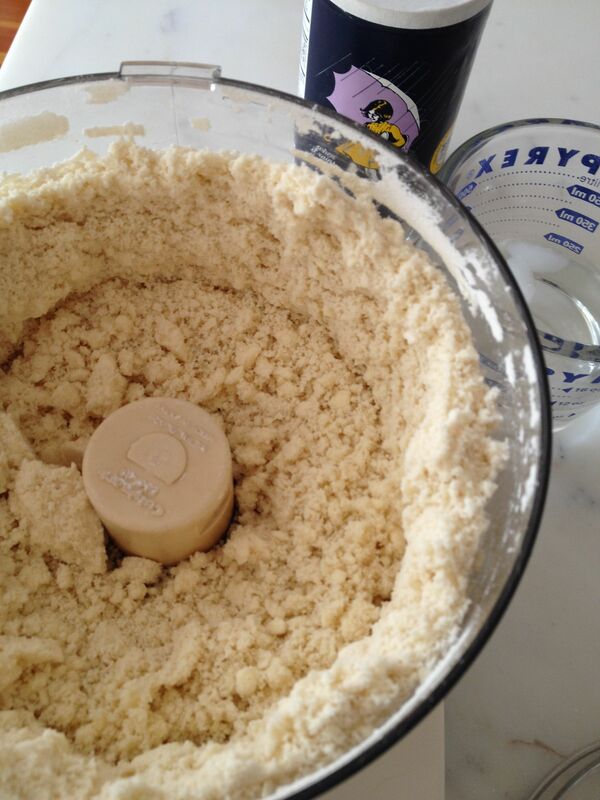 (Freeze any leftover dough.) 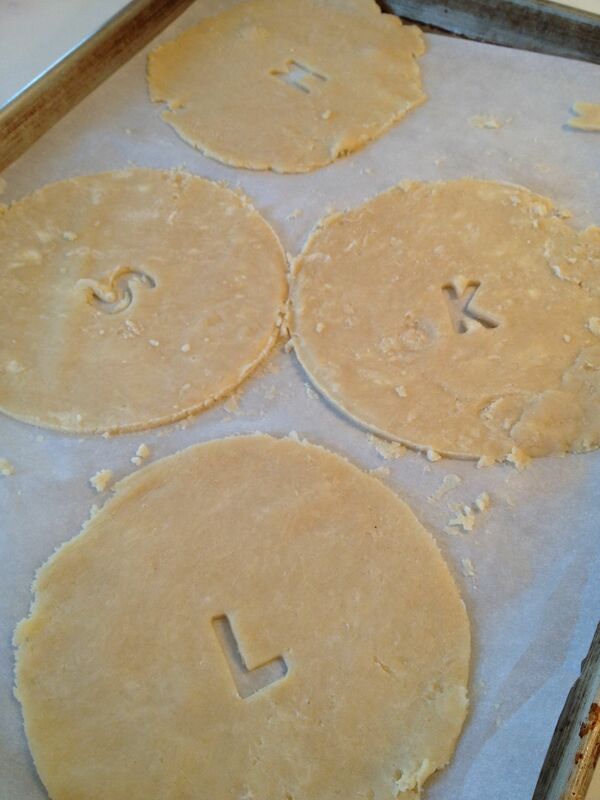 Place dough tops in refrigerator until ready to bake tops or assemble pies. 3 cups cooked/leftover or frozen vegetables of choice: diced carrots or chopped green beans (frozen OK; cook 1 minute in a microwave); diced cooked potato or sweet potato; frozen peas or corn (no need to cook; add to sauce right from freezer). 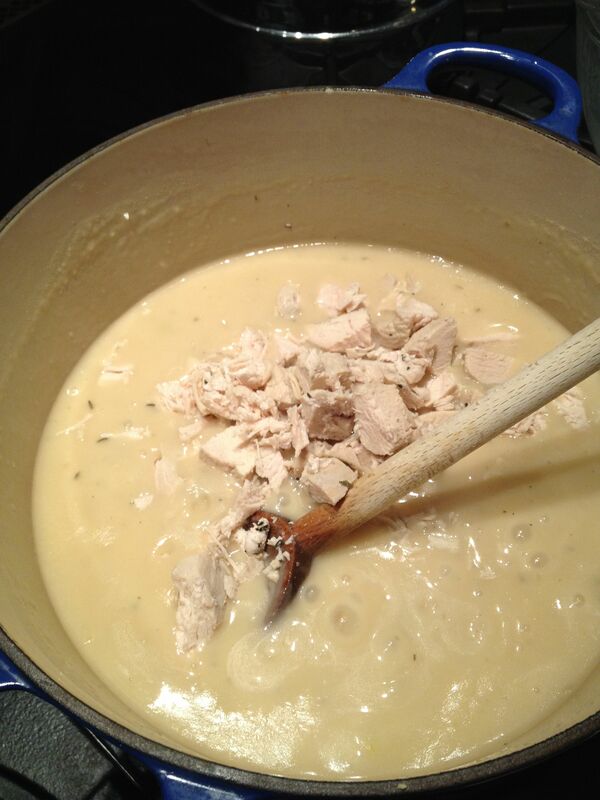 In Dutch oven or heavy saucepan over medium heat, add raw chicken breasts, chicken stock, thyme & bay leaf (if using) and bring to a simmer. 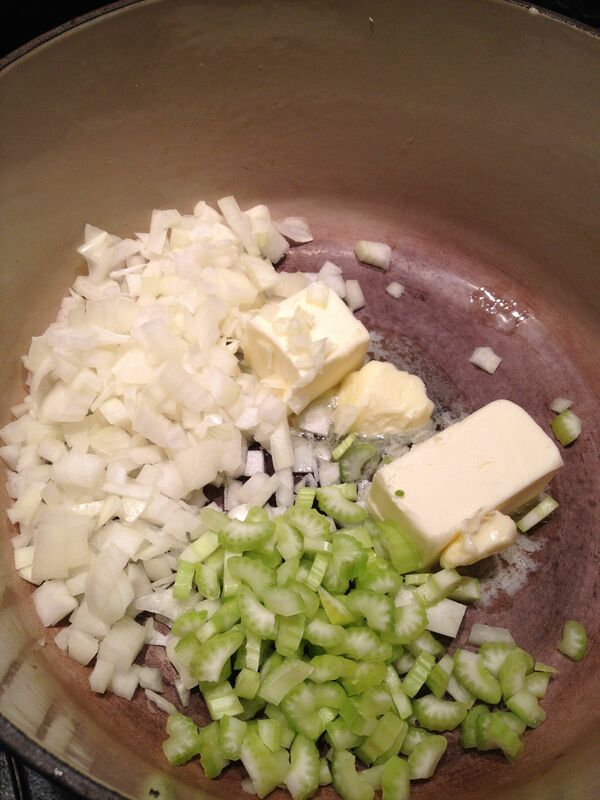 Add any uncooked vegetables that you’d like to add to the pot pies. 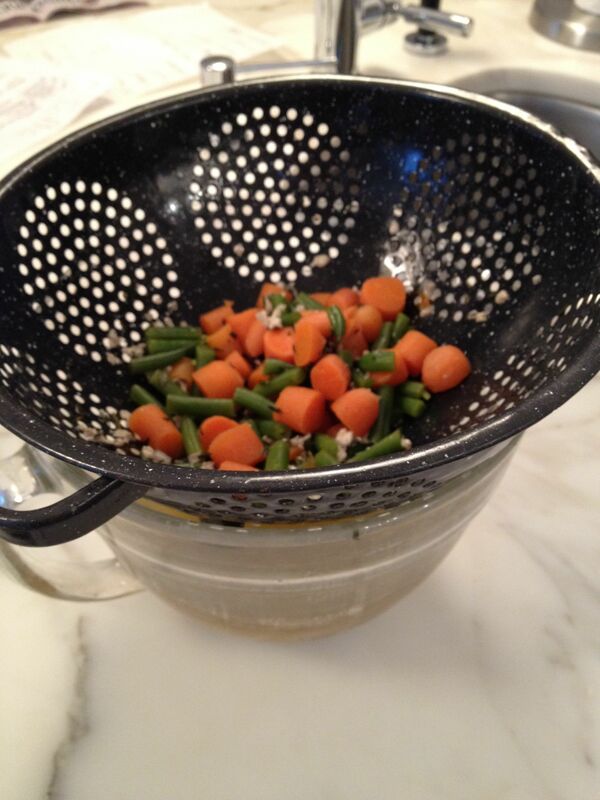 (Carrots & cut green beans were added here.) 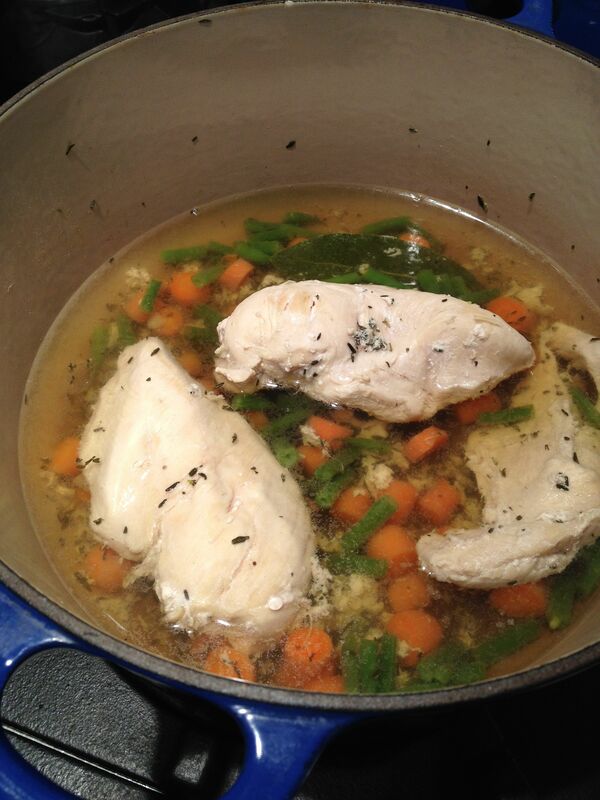 Simmer gently for about 15 minutes, or until chicken is no longer pink in the center. Remove from heat. Remove chicken with tongs and set aside to cool. When pan is cool enough to handle, pour stock through a colander or strainer into a large (4-cup minimum) measuring cup or bowl. Discard bay leaf. Wipe pan dry with paper towel. 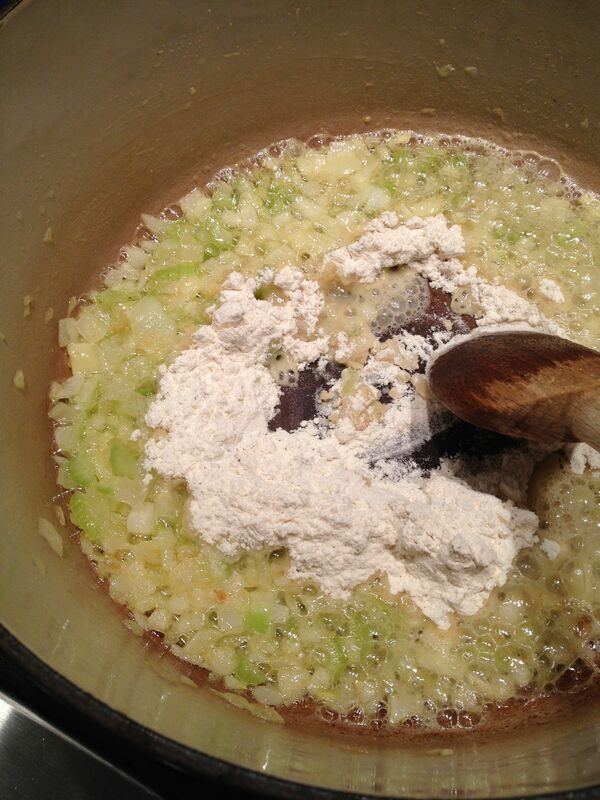 Add flour and cook for another minute or two. 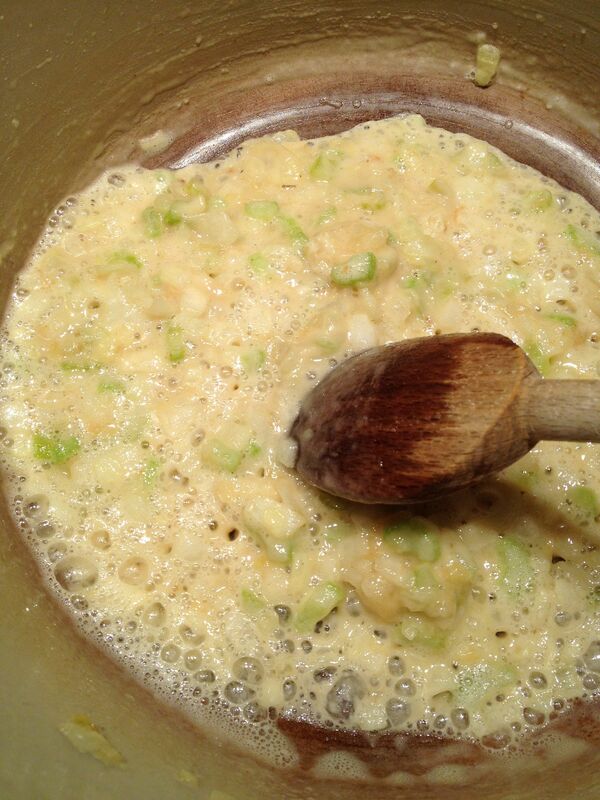 Stir in sherry or white wine (will form a thick paste). 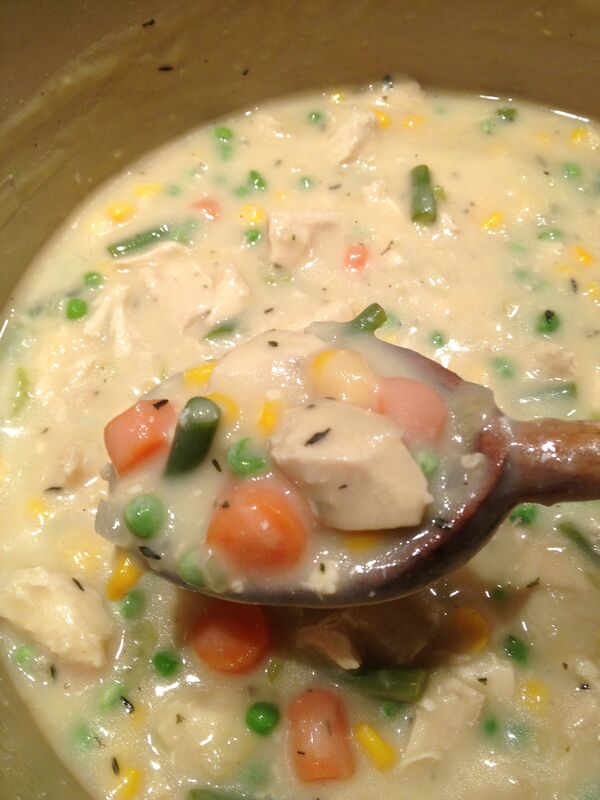 Unless you are creating individual custom pies (i.e., carrots in some but not others), add the cooked and/or frozen vegetables to the sauce and simmer until heated through. 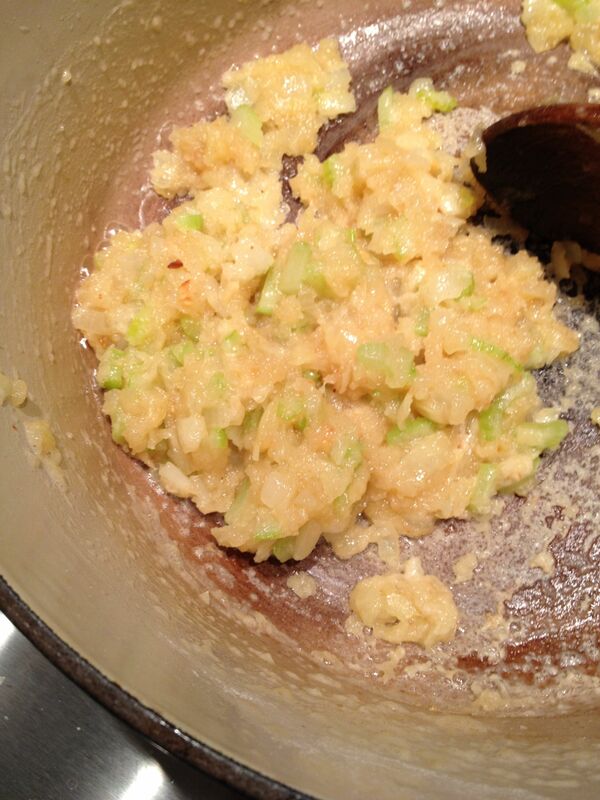 Taste sauce for seasoning, adding an additional pinch of salt if necessary. 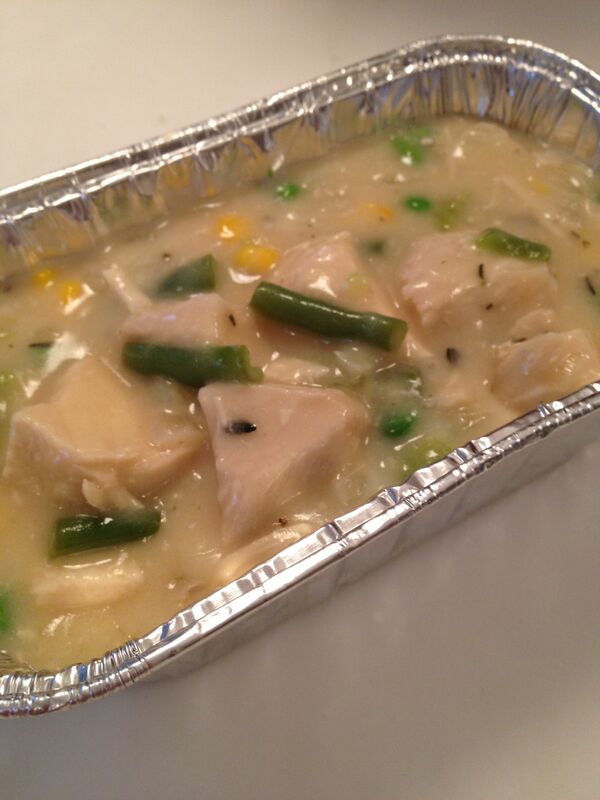 At this point, the filling (or stew) is ready to serve if you are using the pre-baked tops method. 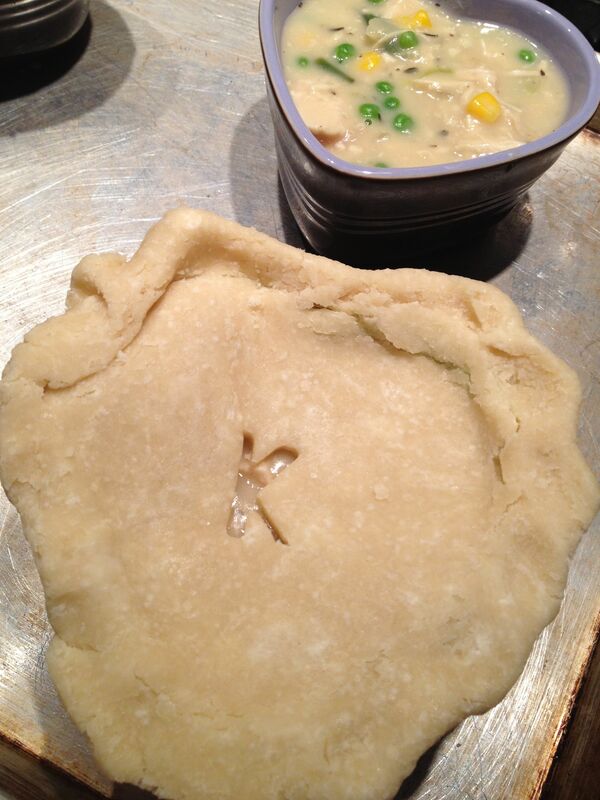 For custom-vegetable pies, distribute the vegetables among pies as desired. Remove dough tops from refrigerator. Bake on parchment-lined baking sheet (at 425ºF) for 15 minutes or until pastry is golden brown. Let cool on baking sheet. 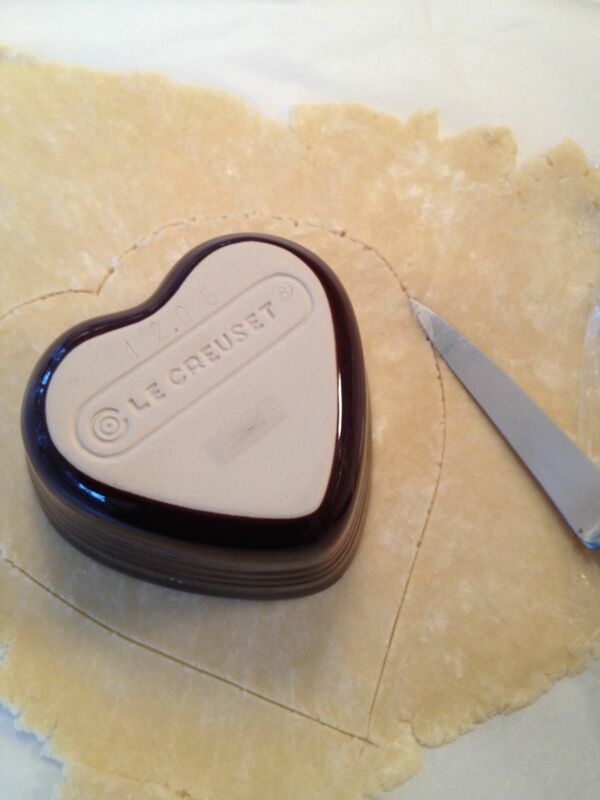 When ready to serve, ladle hot filling into bowls and carefully top with cooled pastry crusts. 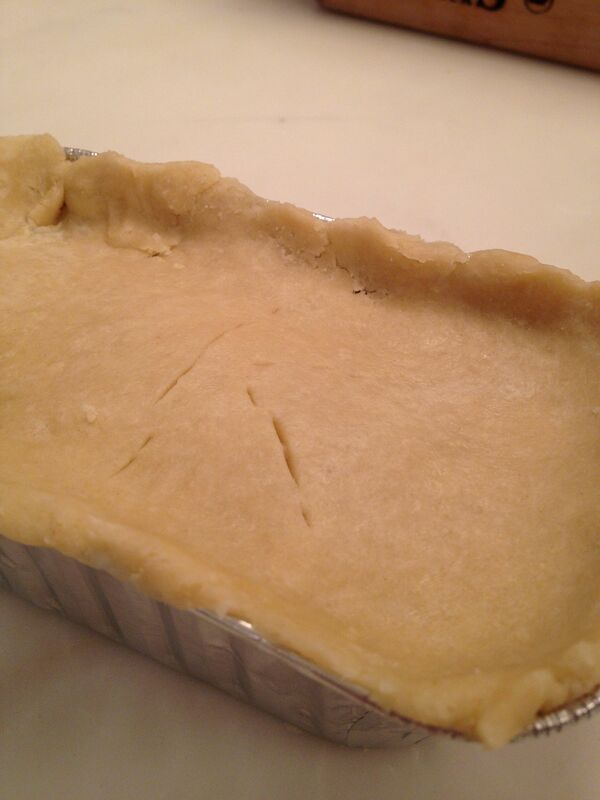 Place pies on a baking sheet and bake at 425ºF for 20 minutes or until pastry is golden brown and sauce is bubbling. Allow pies to cool 5-10 minutes before serving. 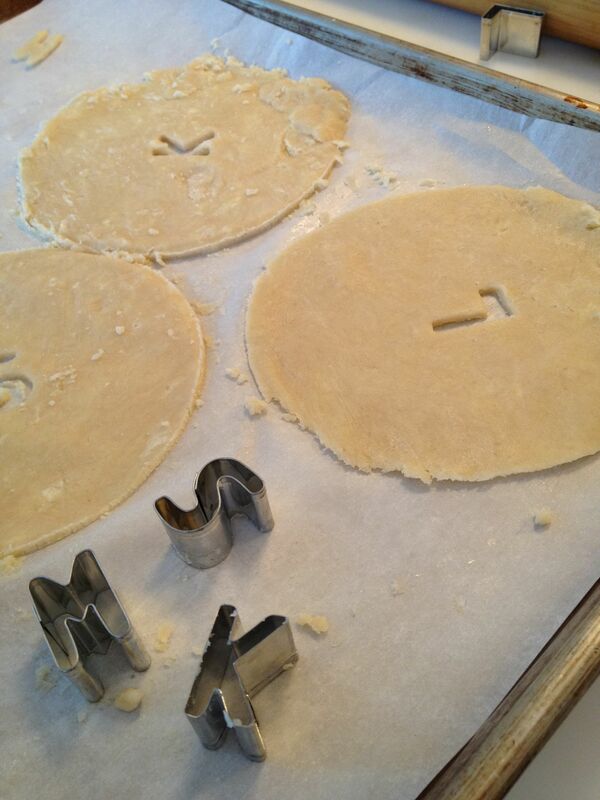 Add filling to mini aluminum loaf pans and top with unbaked pastry dough. Seal/crimp edges and cut steam vents. Freeze in a plastic freezer bag. Whenever ready to bake, heat oven to 425ºF and bake frozen pie for 45 minutes – 1 hour or until golden brown and bubbly. 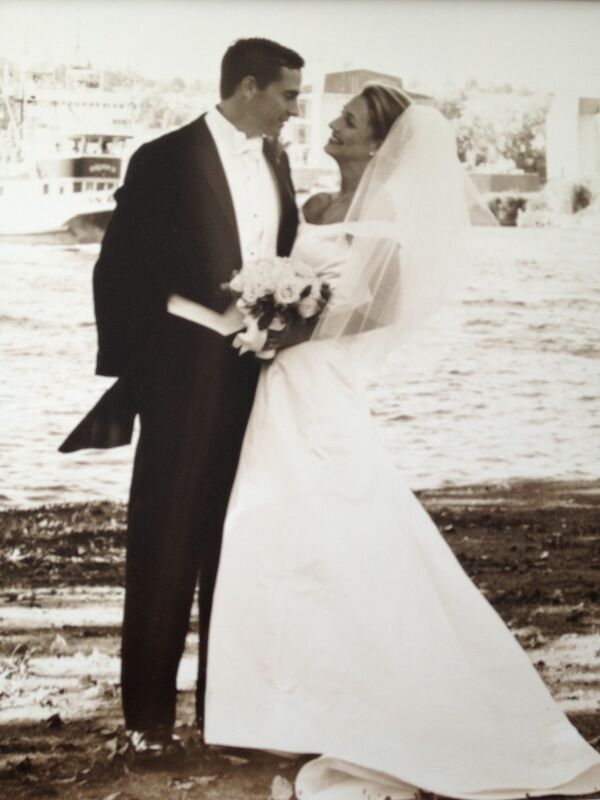 This entry was posted in Holidays, Main Courses, Soups, Uncategorized, Vegetables and tagged chicken pot pie, individual pot pies, pie crust, poached chicken, Valentine's Day by subeeskitchen. Bookmark the permalink. Que c’est beau !! de la famille, des souvenirs, de l’amour, une mariee magnifique….un vrai reve ce blog! 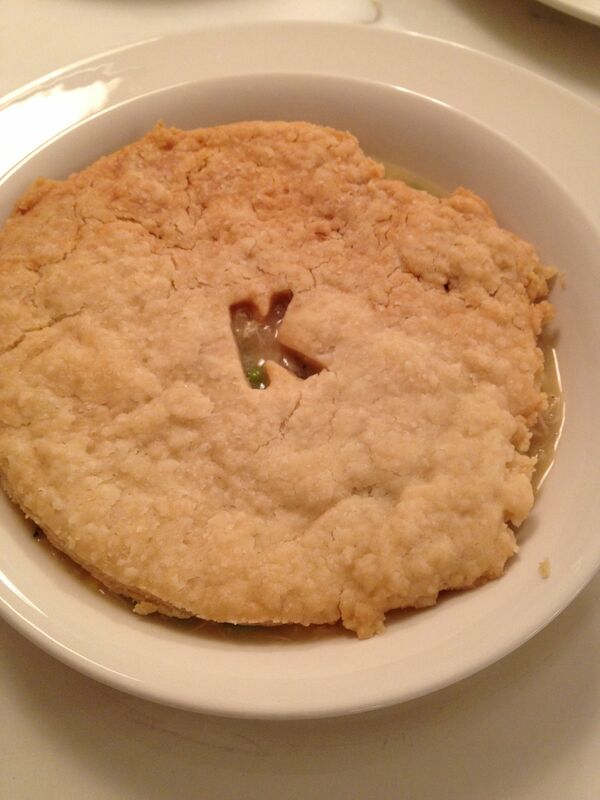 moi qui ne suis pas tres “chicken pie”, je crois que je vais etre obligee de tester celui-ci. Merci pour tes mots ! Oui – il faut tester cette “galette de poulet” … Bon ap ! Sue, merci pour cette recette qui m’a l’air bien delicieuse. Je vais la faire cette semaine! Sue, this was a fabulous recipe. 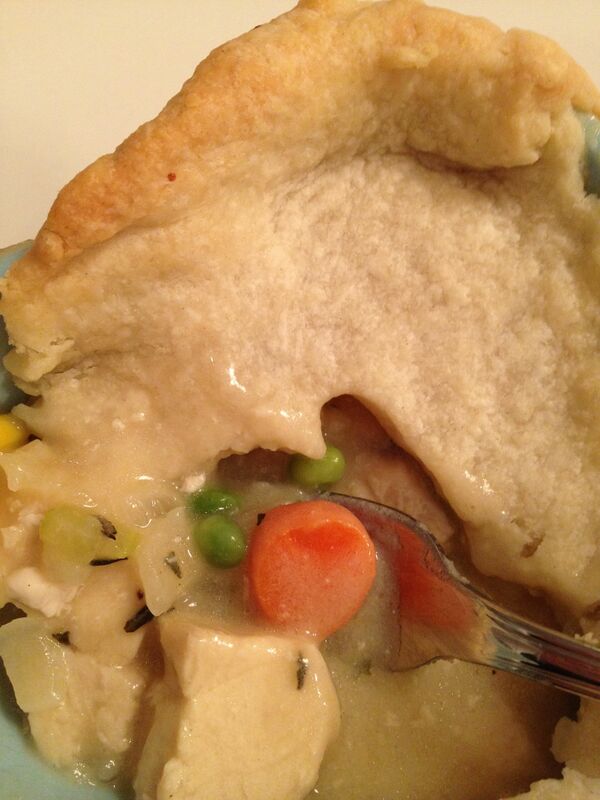 I’ve made lots of pot pies in the past that didn’t wow me. This is the best so far! I have to confess that I didn’t break out the food processor though.